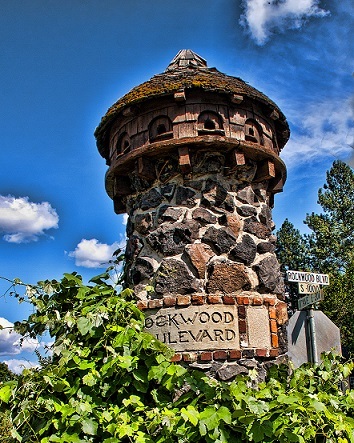 Experience one of Spokane's great traditions and a cornerstone of Mother's Day weekend - the Northwest Museum of Arts & Culture’s annual tour of historic homes and structures. This year the Museum celebrates the tour’s 30th anniversary, and we are excited to feature five wonderful homes located in Spokane’s historic Rockwood Neighborhood. The homes are in a variety of architectural styles and built dates. Some additionally are contributing properties to the Rockwood Historic District, which was established in 1997. Cresthill, Highland, Plateau, and Upper Terrace are names which evoke images of natural geological landscapes. In the historic Rockwood Neighborhood, these names refer to some of the wide, green, and treelined streets in the area, that not only help beautify it, but guide the way to an eclectic blend of historic homes from mansions to bungalows, most of which were built during the first-half of the 20th century. Tickets for the tour are $15 for museum members and $20 for non-members. They may be purchased on this website or by telephone or in person at the museum until 5 pm, Friday, May 10, during normal museum business hours 10 am to 5 pm, Tuesdays thru Sundays. Tickets for the tour will also be available to purchase during the weekend of the tour: Saturday, May 11, and Sunday, May 12, 12 pm to 4 pm either day - and ONLY at our designate tour site check-in and registration location. *One of the homes on this year’s tour is serving as the check-in and registration location. You will receive the address for this location once you have registered for the tour. A tent, and sign boards with balloons, will be present at this site to assist you in easily finding the location. You will be receiving a tour booklet, which serves additionally as your admission ticket to the tour. Your booklet provides, besides your admission to tour the houses, general information about the neighborhood’s history, the houses featured on the tour and their physical addresses, and suggestive points of interest for you to consider visiting while on the tour. For additional information about this year’s Mother’s Day Tour, or to purchase tour tickets by telephone during normal business hours, contact us at visitor.services@northwestmuseum.org or 509.363.5355. Tickets purchased here work for both Saturday and Sunday. Tickets are not date specific.